Celebrated as an enduring symbol of classic Italian Glamour, Acqua di Parma is one of our staple luxury fragrances. 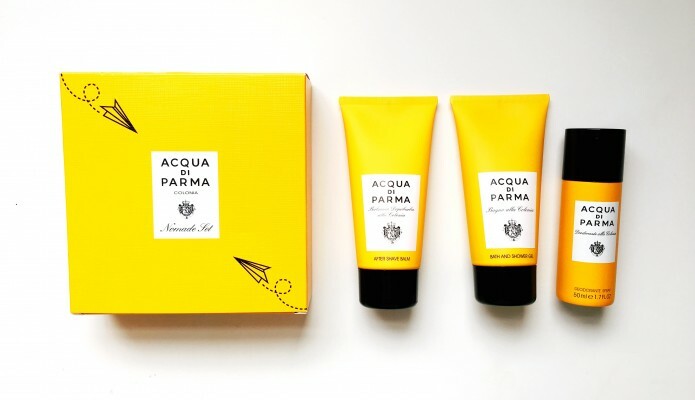 Because we never tire of its timeless elegance, when we learnt of the launch of a new Acqua di Parma Colonia Nomade Travel Set we were…thrilled! These pocket rocket versions of our favourite hero products have slipped straight into our grooming regime, and into the back pocket of our jeans. The three compacted classics are the Colonia Aftershave Balm, Colonia Bath and Shower Gel and Deodorant spray. All three of these pocket rocket products exude the signature essence of Acqua di Parma in a perfectly measured amount, resulting in lasting freshness without being overpowering. The must-have Colonia aftershave balm gives skin a smooth and flawless appearance with the scent of Bergamot and Orange, enhanced further by Jasmine. A scent which will last long after your shave, and a texture which absorbs effortlessly into the skin. The Shower Gel and Deodorant Spray also possess these intense scented notes, in formulas designed to maintain the skin’s natural balance and provide immediate and lasting freshness for even the most sensitive of skin. What’s not to love!